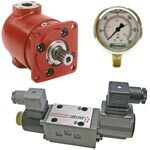 Advanced Fluid Systems carries a complete line of hydraulic, electrical and mechanical products. Learn more on our Product Lines page. Advanced Fluid Systems' hydraulic repair services are an economical way to keep your systems operating like new. From basic pumps and valves, to complex servo valves and complete systems, we have the experience and tools to service your entire system. Our "no risk" quotations give you the option to repair it, buy it new or send it back with no obligation. Learn more on our Hydraulic Repair Services page. Advanced Fluid Systems' hydraulic field service department supports you from installation through the life of your system. We provide a wide range of services at your site including system-to-application integration, custom piping and hydraulic system troubleshooting. Learn more on our Hydraulic Field Services page. 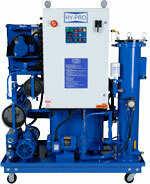 Advanced Fluid Systems maintains a Hy-Pro filter transfer cart and two Hy-Pro vacuum dehydrators for rental. Our Hy-Pro filtration systems are an inexpensive way to remove water, gases and particulate from your hydraulic fluids. Are you considering buying a fluid conditioning system? Rent a Hy-Pro V series and try it before you buy it. 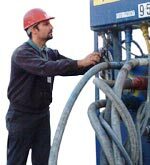 Learn more on our Hydraulic Fluid Filtration Rental page.